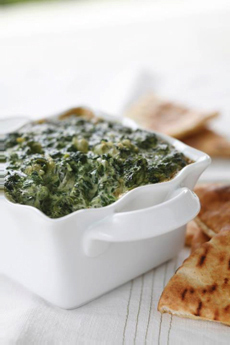 What do you like to do with spinach dip? Photo courtesy Vermont Creamery. Many people enjoy spinach dip; they just don’t enjoy it often enough. Recipes vary greatly (here’s a super-rich spinach-mascarpone dip). Zabar’s, the famed food emporium in New York City, is known for its vegan spinach-arugula spread, a garlicky spinach dip variation with peppery arugula punch, made with Tofutti instead of a dairy product. The ingredients are spinach, arugula, Tofutti, pesto, caramelized onions, roasted garlic, salt and pepper. Zabar’s chefs recommend it to liven up favorite comfort foods, weeknight dinners and entertaining staples. You can use your favorite spinach dip variation, based on using cream cheese, sour cream, Greek yogurt or a combination. 1. Stir spinach dip into macaroni and cheese for extra color and flavor. 2. Spread it onto split French or Italian bread loaves, cover with minced garlic mixed with a little olive oil and broil, for a twist on garlic bread. 3. Mix with boiled halved or quartered potatoes and scallions for zesty potato salad. 4. Use instead of mayo on a BLT or other sandwich. 5. Use instead of mayo in chicken, egg, tuna, salmon or pasta salad for pumped-up flavor. 6. Mix into mashed potatoes. 7. Spread on sliced, toasted bread or crostini and serve as appetizers or with a salad. 8. Spread on crostini, cover with Gruyère or other melting cheese and broil; then float the crostini in your favorite soup. 9. Use instead of cream cheese on a bagel with lox. 11. Mix with low-fat plain Greek yogurt for a healthy crudité or chip dip. 12. Mix with ricotta for a lasagna filling. 13. Add to a baked potato instead of butter or sour cream. Would you like to add a tip or two to this list? Let us know. 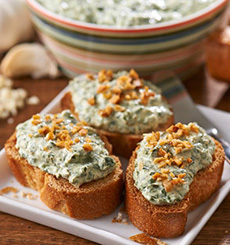 Spinach dip spread on crostini. Photo courtesy Zabars.com.